Just Saiyan, Dragon Ball Legends is now available from the Google Play Store in the U.S.
Video game producer Bandai announced today via tweet that Dragon Ball Legends is now available for U.S. Android users. All of the characters you know and love make appearances, including Goku, Trunks, Vegeta, Gohan, Krillin, 18 and more. When installing DB Legends, you have the option of downloading the entire game (364MB) or a minimum amount of files (92MB). Obviously, installing all of the files will take more time (use a Wi-Fi connection), but the game will run smoother without frequent stoppages to download the next screen. During battles, players control their character by swiping on the screen, and special attacks are available by tapping on cards found on the bottom of the display. The game includes an original story written by DB creator Akira Toriyama, which includes a new character that he created. You can also take on other Dragon Ball fans around the world in one-on-one battles. Keep in mind that while it is free to download and play, you can make in-app purchases ranging from 99 cents to $40.99. If you love Dragon Ball, you're going to love this game! Lines are already forming in front of Bandai HQ. 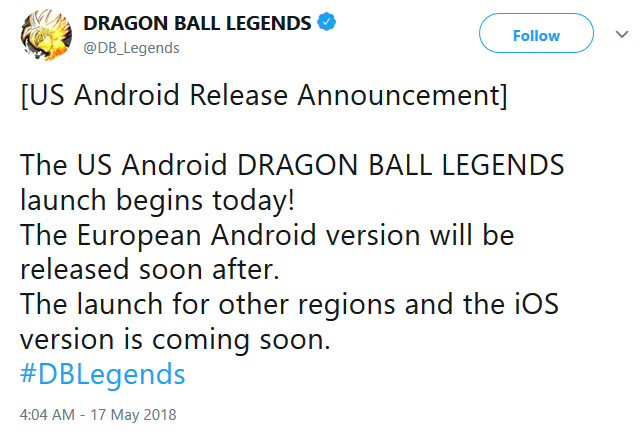 About time something is deveolped for Android before iOS! The times are changing!